Good oral health is more than just a pretty smile. Poor dental hygiene can put both your pet’s health and your pocket book at risk. “Dog breath” – or a cat with a foul-smelling mouth – can be a sign of untreated dental conditions. If left untreated, you may put your pet at risk for greater problems such as periodontitis. Routine cleanings can help prevent periodontal disease and save money in the long run. More importantly, a complete oral examination can detect hidden health problems. Even if your pet’s breath smells fine, there still could be dental conditions that are hard to spot without a complete veterinary exam. Schedule your pet’s checkup with us now. We will do a thorough checkup to make sure your pet is at optimum health. We also can show you how to brush your pet’s teeth in between exams and cleanings. 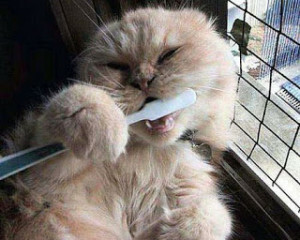 Brushing is the single most effective thing you can do to keep your pet’s teeth healthy between dental cleanings. We are committed to your pet’s dental health and wellness, and we know that you are as well. Book your appointment today!